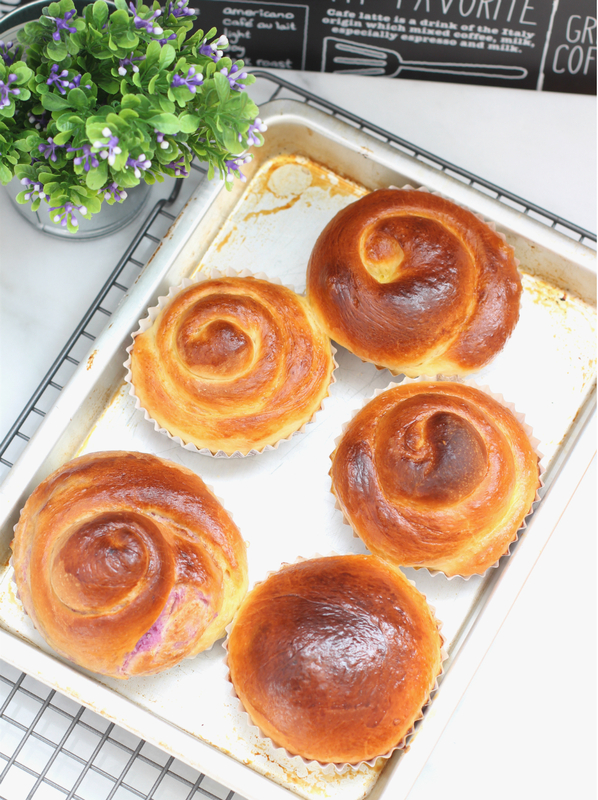 my bare cupboard: Ube ensaymada / Filipino-style bread rolls "
Ensaymada is a Filipino-style bread adapted from a sweet pastry bread originated in Mallorca , Spain , called Ensaimada de Mallorca. The first time I've made Ensaymada de mallorca was more than 5 years ago . 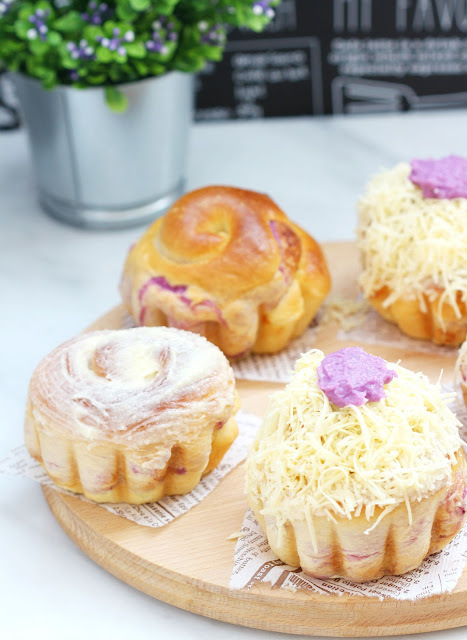 Those homemade ensaymada reminds me of the one I usually ate when I was young and not the brioche-like ensaymada that is popular back home nowadays . 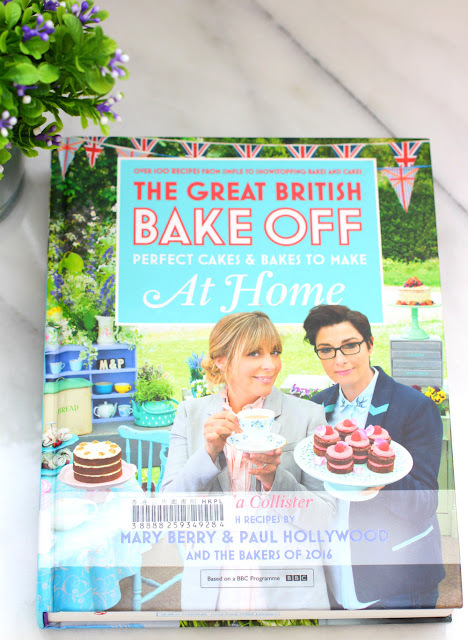 This recipe is from The Great British Bake Off book ( 2016 ) which I slightly modified . 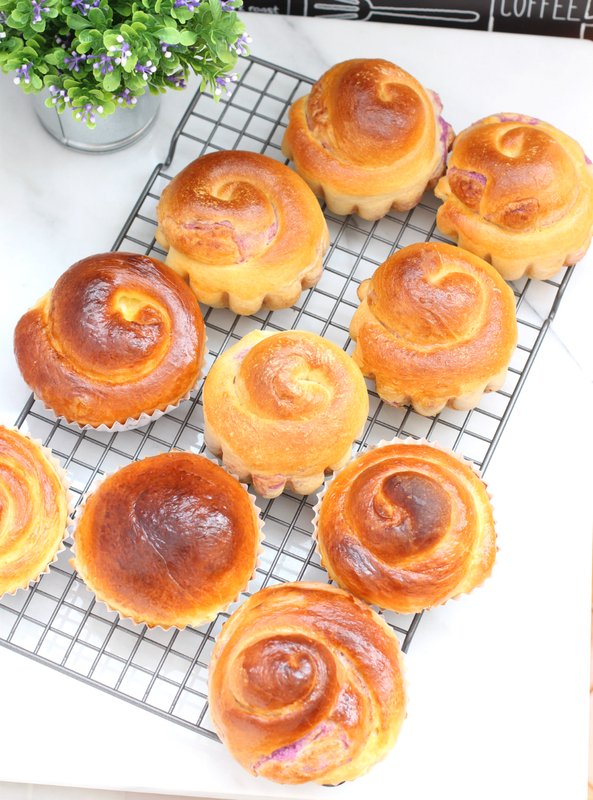 At first , I wasn't keen on using the recipe as the photo of the mallorcas look dense , not the fluffy brioche-like ensaymada that I was looking for . So I tweaked the recipe a bit , added more flour , used some plain yogurt and reduced a bit of butter . 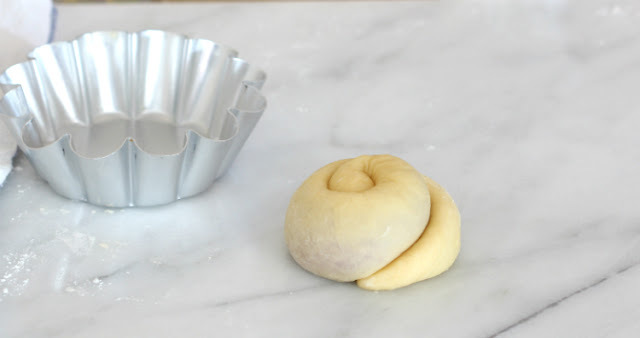 And kneaded until it pass a window pane test or show a characteristic as it is a buttery dough . Okay , I didn't knead it myself as I used my bread machine . My modified version certainly created a buttery and fluffy sweet bread though not in par with the almost cakey version of Muhlach ensaymada . My tweaked ensaymada will stay soft for 3 days stored in a plastic food bag at room temperature. 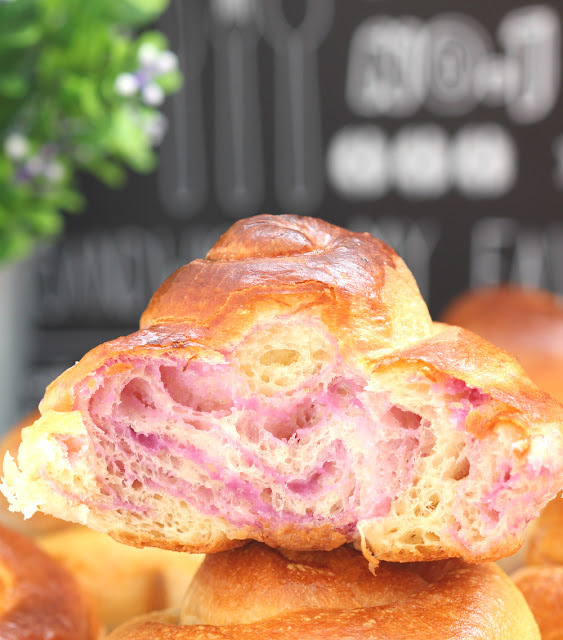 * Pour in the eggs , yogurt and water into the bread machine pan , followed by sugar , salt and flour . Make a small well on the flour and add in the yeast , cover yeast with some flour . Select dough programme and add in the butter after 20 minutes . Turn off the dough programme then start it again and let machine knead the dough for another 20 minutes . The reason for this is that my machine kneading cycle which is 23 minutes is not strong enough to knead the dough well so another extra time is needed to make it smooth and elastic . 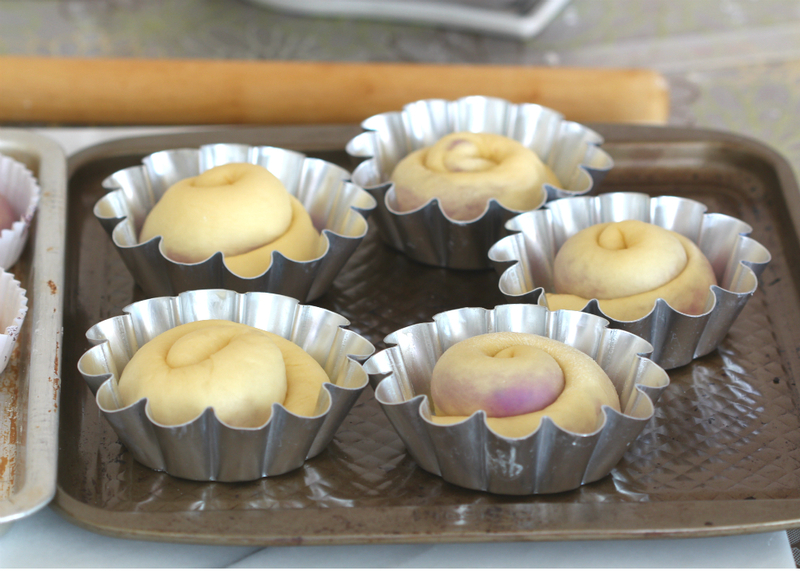 * Form dough into a smooth round ball then place it in a lightly-oiled mixing bowl , cover tightly with cling / plastic wrap . Let stand at room temperature for about 20 minutes then place in the fridge to chill overnight . 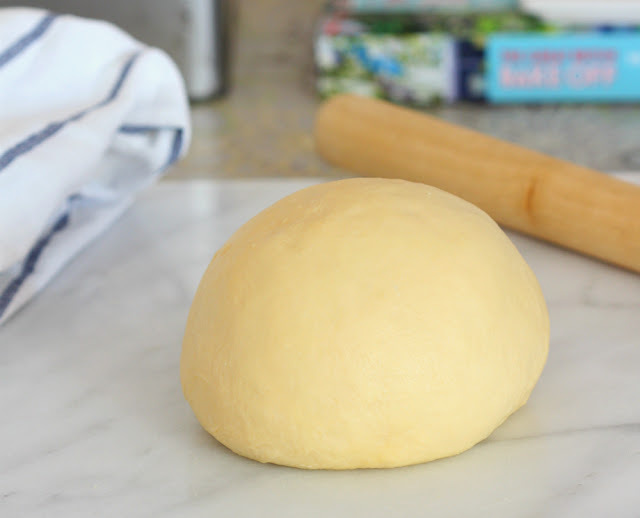 * Tip dough on a lightly floured the work surface , knead briefly to form into a smooth round ball . 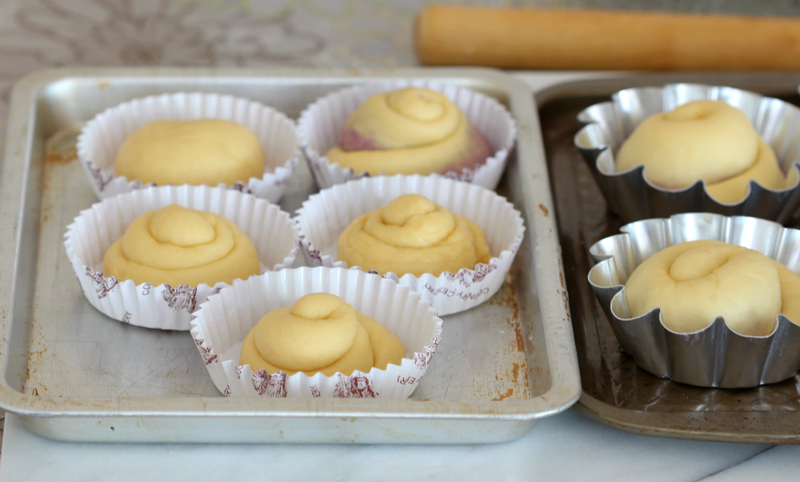 Divide dough into 10 portions @ ( approximately ) 77 grams each ( my final dough is 773 grams ) . Let rest , covered , for 15 minutes . 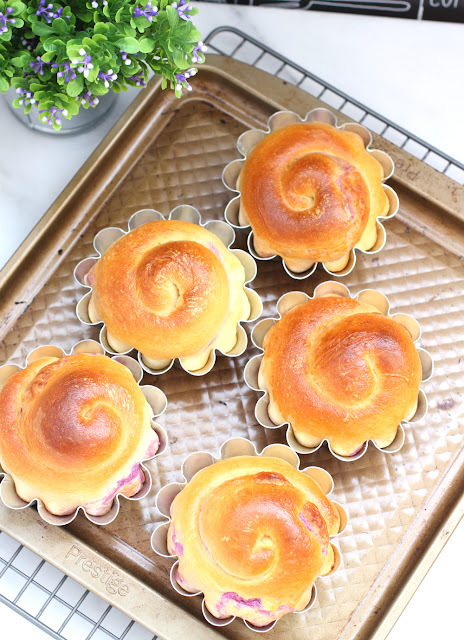 * Lightly-greased 10 4 1/2 x 3 1/4-inch brioche tins , set aside . * Roll dough , one portion at a time ( keep the rest covered ) , into about 9 x about 5-inch rectangle . Spread 35 grams of ube jam on top of the rolled dough , leaving a bit space on all sides . 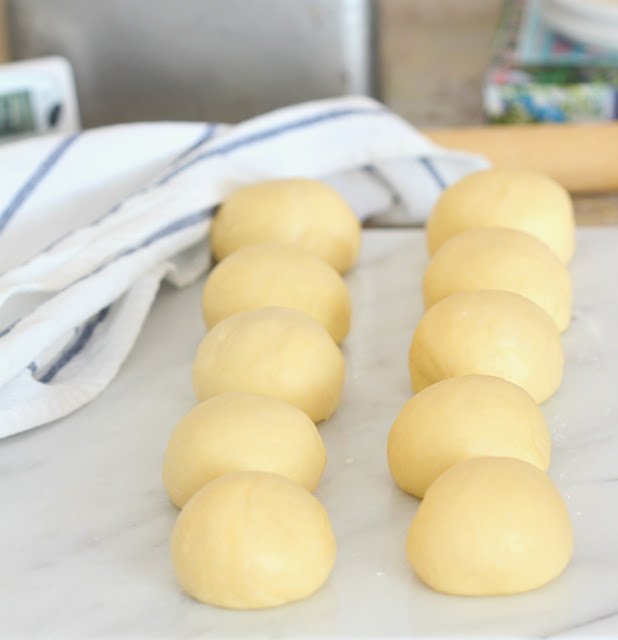 Starting on the long side , roll dough into a log and gently pinch seam to seal . Roll the log until seam is smooth and about 10-inch in length , coil into spiral and tuck end underneath . Place roll on a prepared tin and place tin on a baking sheet , lightly cover with plastic wrap or clean tea towel . Continue with the rest of the dough . * Let dough rise until double in size , about 1 1/2 hours , depending on ambient temperature . * Place oven rack on lower middle position and preheat oven to 190ºC . * Gently brush the top of each roll with egg wash .
* Bake for 15 to 20 minutes until rolls are golden brown . 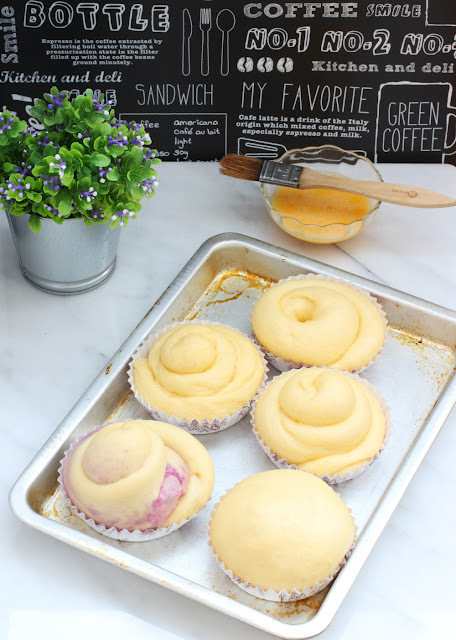 * Transfer tins to wire rack and let cool for about 10 minutes before removing rolls . 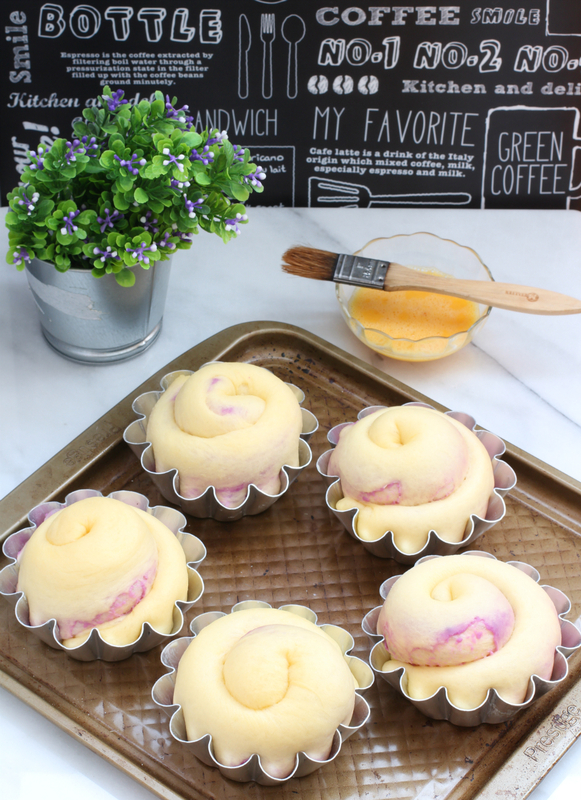 Let cool completely before adding the toppings . They are gorgeous! Have I mentioned that I adore ube? 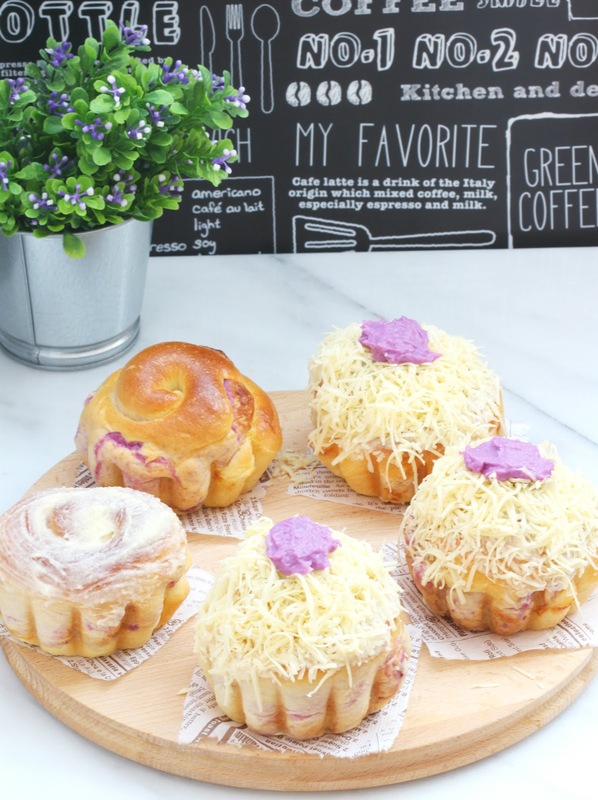 Your ensaymada is mouth watering, I wish I'm as good as you with baking.